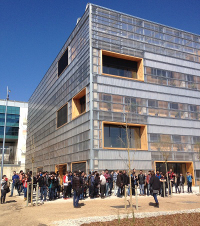 Our research group is located on the Bellaterra Campus of the Universitat Autònoma de Barcelona, in the new building of the ICTA-ICP (Building Z). The Bellaterra Campus is located about 20 km outside of Barcelona and can be conveniently reached from Barcelona's city centre by Ferrocarril (FGC, line Barcelona-Vallès, destination: Universitat Autònoma). At Plaça Catalunya, take line S-2 (green, towards Sabadell) or S-55 (blue, towards Universitat Autònoma) and get off at the stop Universitat Autònoma". The trip takes about 30 minutes and trains leave about every 10 minutes.